Stamford, CT- Celebrating food, culture and community, the 2nd Annual Hey Stamford! Food Festival is set for Saturday, August 25 & Sunday, August 26, 2018 at Stamford Downtown’s Mill River Park from 1:00 pm - 9:00 pm. Tickets are on sale now at www.heystamfordfoodfest.com. Over two days, The Hey Stamford! 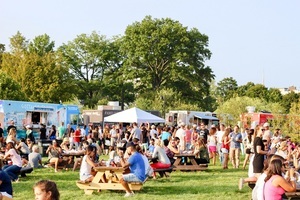 Food Festival will feature over 40 of the area’s most delectable food trucks and vendors, The Blind Rhino Beer Garden serving up cold craft and standard beer selections, and a full concert experience. New for 2018, it’s The Fairfield County Bank Kids Zone, featuring a roaming railroad, face painters, glitter tattoo artists, balloon artists and painting lessons. Sunday, August 26: “Country Rocks The Park”! Country Superstar Dylan Scott to headline, performing on The Minchin Buick GMC Mainstage. Also featuring, in his first ever Connecticut appearance, 11-year-old internet sensation, the ‘Walmart Yodeler’ Mason Ramsey. Local group Jump The Gunn and area DJ’s will also be performing. Event times: 1:00 pm - 9:00 pm. Rain or shine, all ages event. Single Day & Two Day Tickets are available. Children under 10 admitted free (with a ticket holding parent/guardian). For more information on The Hey Stamford! Food Festival, including vendor information and ticket pricing, visit www.heystamfordfoodfest.com.